―Cleveland Abbe, “Information Relative to the Construction and Maintenance of Time-Balls.” October 1881. Winslow Upton was a “computer” (in the sense of one who computes) at the U.S. Naval Observatory in 1880. The following year he went to the U.S. Signal Service where he was tasked with compiling a summary on the practice of using time-balls for the distribution of accurate time. The Boston Time-Ball in the dropped position with the hoisting and releasing machines to the right. The practice of dropping a ball at exactly noon every day was used to calibrate the chronometers on ships in a nearby harbor. These accurate timepieces were then used for celestial navigation. The balls were installed on tall buildings within a couple of miles of the docked ships. An example is the Boston Time-Ball. The procedure used in Boston was described by B.M. Purssell of the Signal Corps in Upton’s compilation. At 11:55 a.m. the ball is to be at half mast. At 11:58 a.m. the ball is to be at the top of the mast. At 12h 0m 0s noon (Boston State House time) the ball will fall. Should the ball for any reason fail to drop at 12h 0m 0s, and the trouble is of a nature that can be readily removed, the ball will remain at the top of the mast and be dropped at 12h 5m 0s p.m ; and if the ball should by accident fall before 12h 0m 0s noon, it will immediately be raised again and dropped at 12h 5m 0s p.m. If for any reason it becomes necessary to lower the ball, it will be done very slowly, so that ship masters may not mistake the movement for the noon signal. 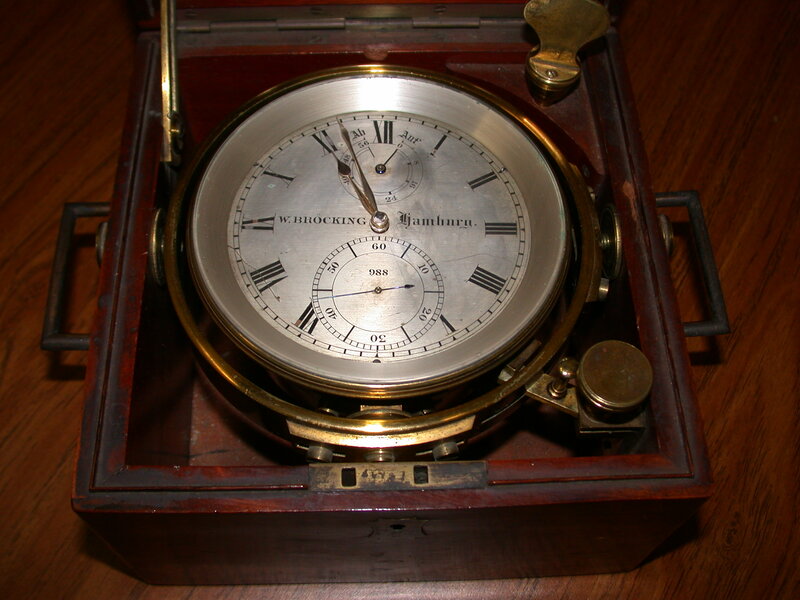 Marine chronometer #988 by Wilhelm Bröcking of Hamburg, 1882. Formerly the property of Carl Barus, Hazard professor of physics in Brown University, 1895 to 1929. The Boston Time-Ball went into operation in May 1878. The ball was 4 feet in diameter and made of rolled plate copper. It was raised on a staff 20 feet high giving a clear 16 foot drop. A brake mechanism was used to stop the ball after it had dropped to within 6 feet of the bottom. 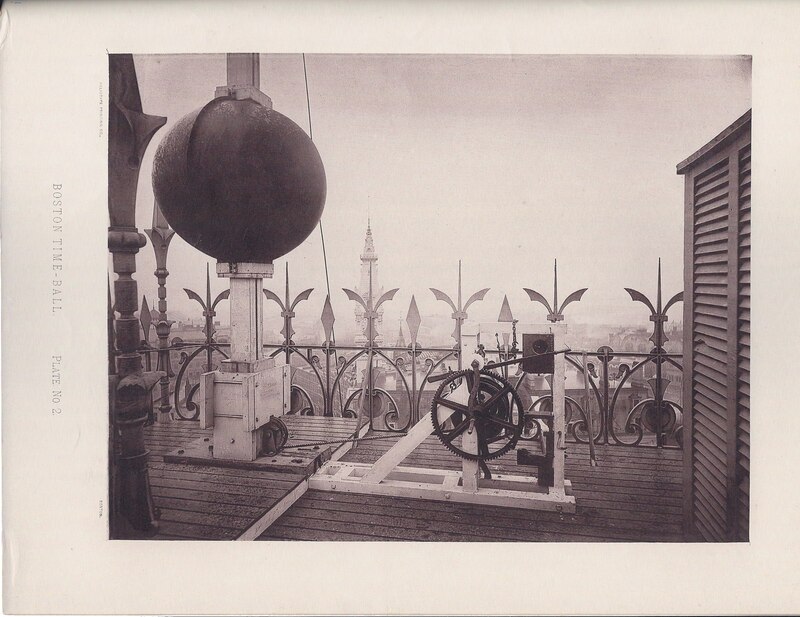 The time signal to release the ball was relayed from the standard clock at Harvard College Observatory by telegraph wire to the ball on the roof of the Equitable Building. A ball of this size could be seen from about 4 miles away. 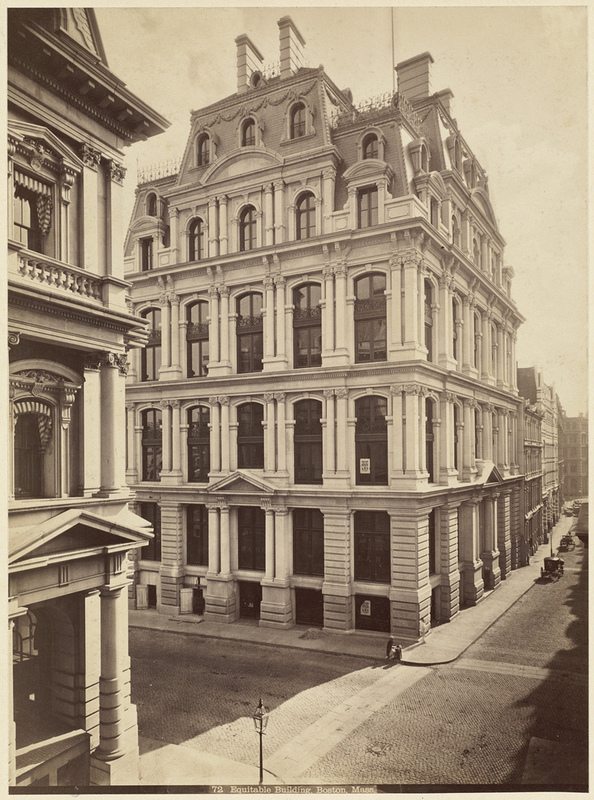 The Equitable Life Assurance Society building, at the corner of Devonshire and Milk Streets. The Naval Observatory in Washington D.C. sent time signals via Western Union telegraph when Upton worked there. By 1888 these signals were used to drop time-balls in numerous port cities including Wood’s Hole, Newport, and New York. The dropping of the ball in Times Square at midnight on New Year’s Eve is a vestige of this earlier practice of disseminating the true time. In 1902 a new time-ball was installed on the taller Ames Building at Washington and Court Streets in Boston. It was operated by the Hydrographic Office and was synchronized to the U.S. Naval Observatory. 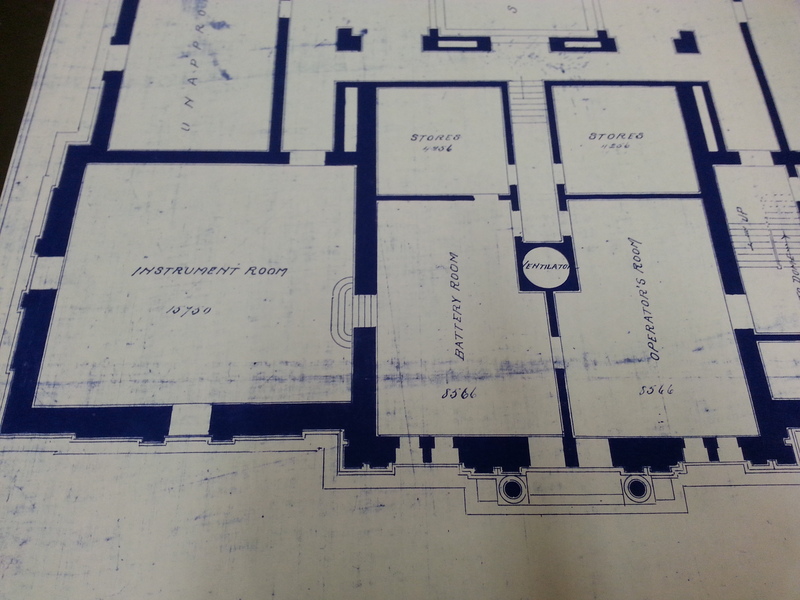 A blueprint of the top floor of Providence City Hall (1878) showing the Battery Room used to power the telegraph for the fire alarms and time signals. From the City Archives. Winslow Upton was appointed professor of astronomy in Brown University in the fall of 1883. He operated a system that transmitted telegraph time signals from precision clocks at Ladd Observatory throughout Providence and to other nearby cities. The accurate time was given by an audible signal instead of a ball dropping.